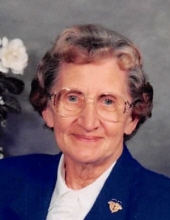 Ruth A. Kreger, age 84, of Clear Lake, SD passed away Saturday, March 16, 2019 in the Deuel County Good Samaritan Society, Clear Lake. Memorial service will be 10 a.m. Saturday, March 30th in the United Methodist Church in Clear Lake. Burial will be in the Lake view Cemetery, Clear Lake. Visitation will be held Saturday one hour prior to the service at the church. Ruth Arlene Kreger was born on September 15, 1934, in White, South Dakota to Henry and Hilda (Prahl) Feldman. She attended grades schools in Argo #27 and Afton #15 and graduated from White High School in 1952. She continued her education at Dakota State College in Madison, SD, obtaining a degree in elementary education. She began teaching at the Clear Lake School in 1954 and taught 4th grade there for 36 years until she retired in 1990. She then did substitute teaching for the next 10 years. On June 1, 1958, she was united in marriage to Douglas Kreger at Zion Lutheran Church in White, SD at the church where she was baptized, confirmed and taught Sunday School. She was currently a member of the United Methodist Church in Clear Lake. She enjoyed reading, crafts, cooking, growing flowers and going on bus tours to various places. Ruth will be missed by many friends, students and people whose lives she touched over the years. She will be remembered for the very special and caring and loving person that she was. Ruth is survived by her brother, Norman (Sondra) Feldman, Sioux Falls, SD; and her sister-in-law, Marie (Wilmer) Feldman, Fargo, ND and is also lovingly remembered by many nieces and nephews. She was preceded in death by her husband, Doug Kreger; her parents, Henry and Hilda Feldman; and her brother Wilmer Feldman. To plant a tree in memory of Ruth Kreger, please visit our Tribute Store. "Email Address" would like to share the life celebration of Ruth Kreger. Click on the "link" to go to share a favorite memory or leave a condolence message for the family.